Dr. Argenziano’s main research field is the clinical diagnosis of melanoma and, particularly, the development of more accurate methods for the early recognition of melanoma. He is author of numerous scientific articles concerning dermoscopy for the diagnosis of pigmented skin lesions and early recognition of melanoma. He is also author of 3 books on the subject (two published by Elsevier, one by Springer). 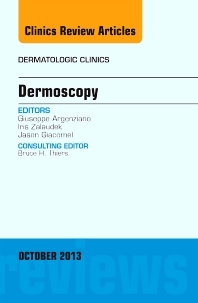 Dr. Argenziano is Secretary of the International Dermoscopy Society and is the Congress Secretary of the First Congress of the International Dermoscopy Society in Naples in April 2006 (www.dermoscopy-ids.org/). His research on melanoma is very well regarded in the field. Because he is both a researcher and clinician, most of his research is very translational and has worldwide adoption. Dr. Argenziano is also among the top 20 researchers by publications in melanoma as indexed by SciVal.